No electricity greenhouse cooling is the original and still most reliable way to make sure plants and crops do not overheat. Stressed plants are more likely to experience cropping problems like leaf or bud diseases and hot temperatures allow harmful insect pests to reproduce quicker; attacking your overheated and weakened plants. 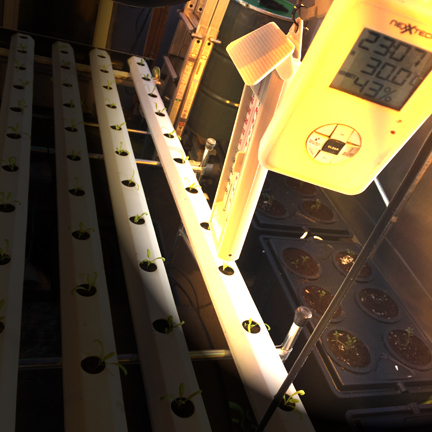 We use electricity as part of our backyard food crop research greenhouse and also as part of our heating solution, while we don’t rely solely on electricity either, both due to expense and fear of power loss or interruption. 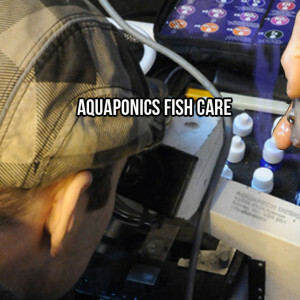 In winter months or aquaponics system could be prone to both losses in the fish and plant aspects, and our hydroponics plants risk frost damage too, although we are situated in a moderate Northern latitude. It’s usually easier to heat a greenhouse than it is to cool it. 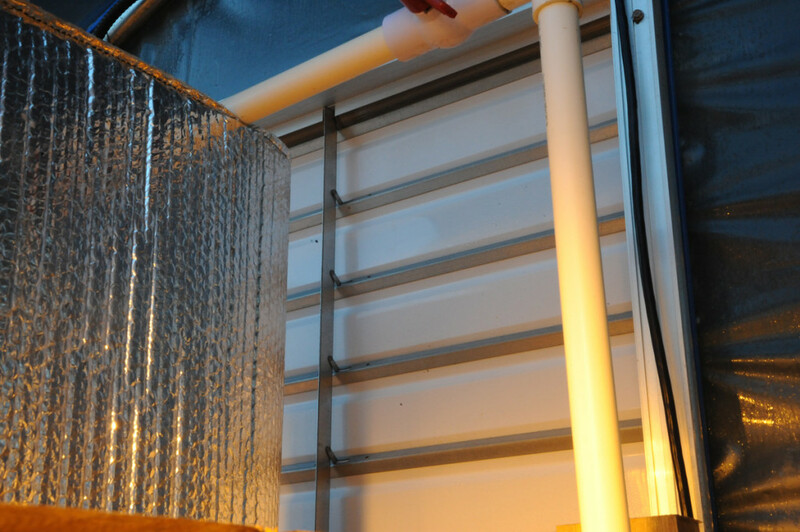 Greenhouse vent fans can be effective, but quality greenhouse vent fans are not inexpensive to buy and require electricity to operate. If there is a power loss on a hot day, plants are more likely to fry in an overheated greenhouse than they are to freeze if there is a brief power interruption in cooler temperatures. Temperatures can soar to incredible levels in an unvented greenhouse during full sun–even if it’s not that hot outside yet seasonally. In short, an interruption in power for greenhouse cooling can be absolutely devastating to both greenhouse crops and the investment of both time and money by the grower. There are several common ways greenhouse operators have successfully used to lower greenhouse temperatures and to provide ventilation without the use of power. Our solution is simple, easy to install, inexpensive and is highly effective when applied to the right sized greenhouse shutter opening. Scroll below to see what we did step by step with our Thermal Shutter or keep reading to learn more about different options. Our no electricity greenhouse cooling plan includes roll up side walls-but since it’s still winter, although mild, we don’t need that much cooling yet and run the risk of giving our plants a chill. 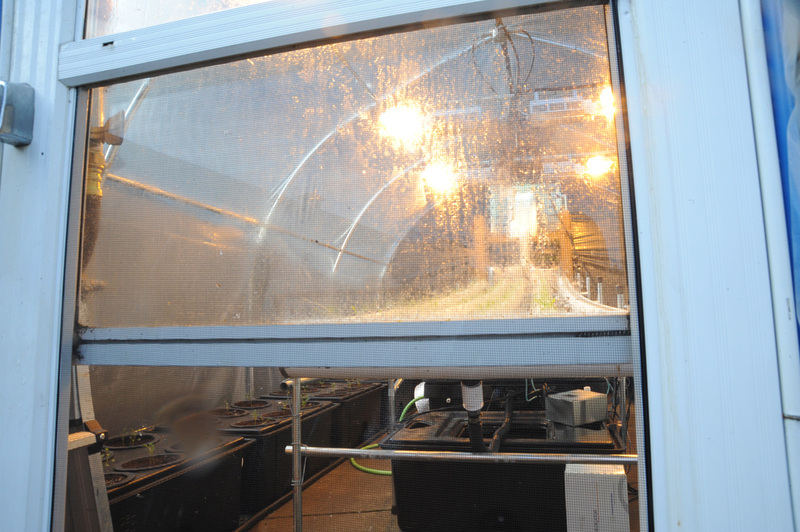 TIP: Drastic and sudden temperature swings in the greenhouse shock plants and hurt growth. Water chillers are great for cooling hydroponics and aquaponics systems–however, they can’t work when power is unavailable. Once warmer seasonal temperatures become the average, we’ll install our roll up side walls. 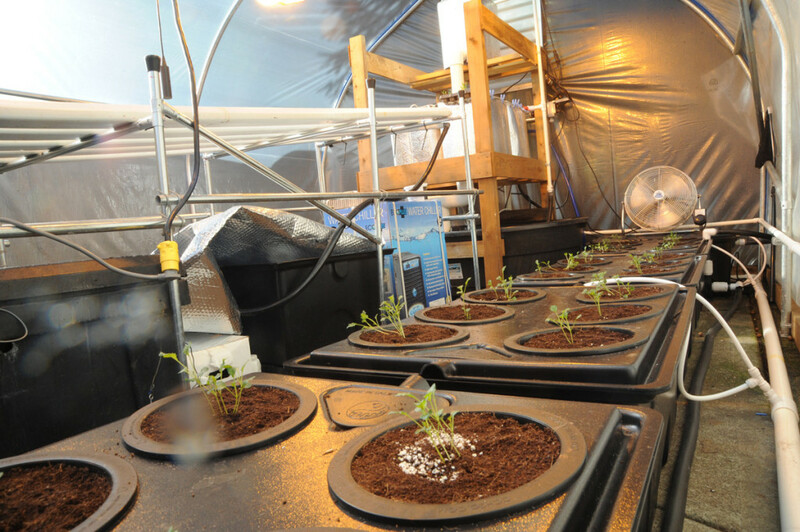 For now, they remain locked down to help keep plants happy and the heating bill reasonable in our backyard greenhouse for growing and research with food crops. We also have a manual lift or lower shutter with insect screen on our salvaged (and super awesome) greenhouse door–essentially a swinging tempered glass patio door with shutters. 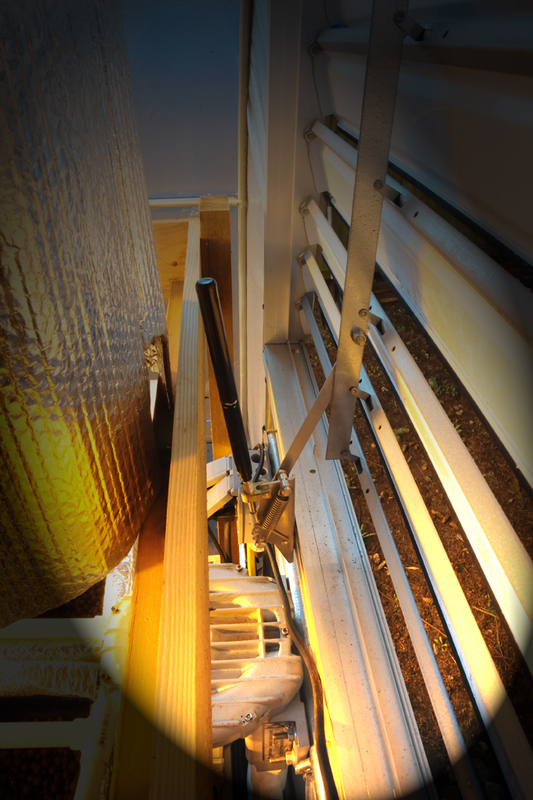 This leads us to a great solution for no electricity greenhouse cooling, and that’s A Thermal Shutter (Solar Venting). This is a really cool (pardon that) solution for greenhouse cooling that is reliable and requires no power to work whatsoever once installed. Super cost effective too. Note: A high quality aluminum shutter like the one we have featured here is worth the investment to ensure trouble free operation and a tight closure when not active (can also be motorized with a powered actuator). 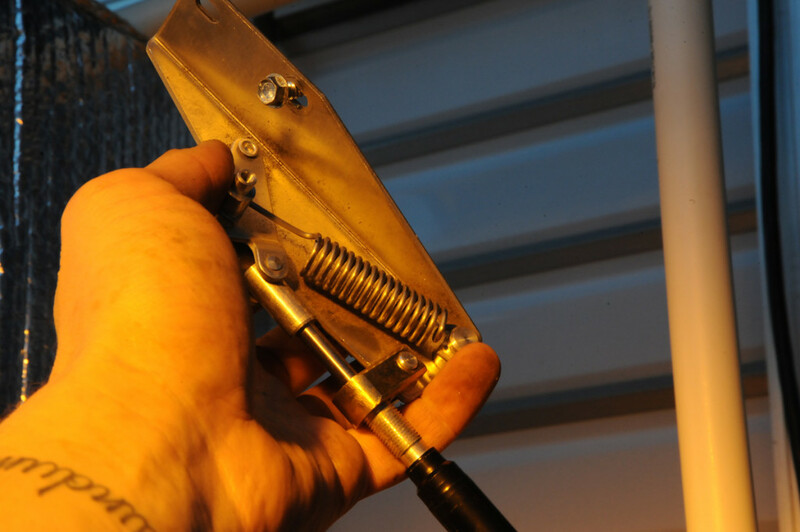 You can even adjust the “set point” somewhat at which it starts to open by rotating the threaded portion where the cylinder attaches to the bracket that operates the lever to create an opening on your greenhouse ventilation shutter. 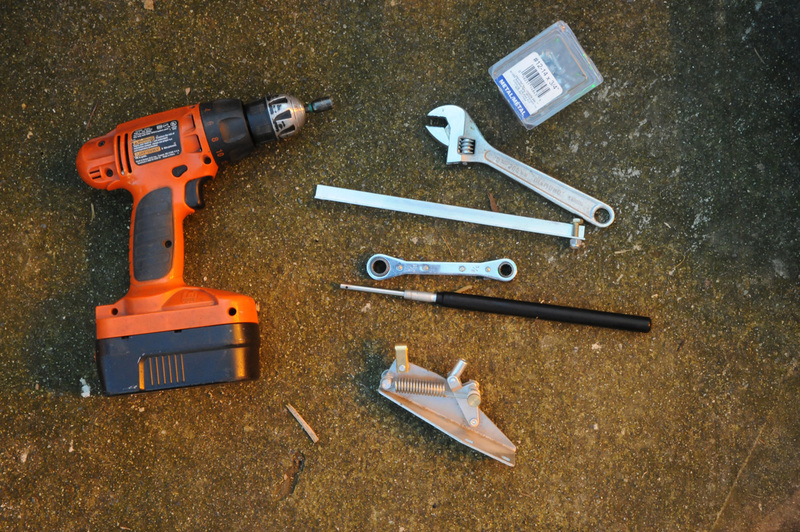 Just look at a thermometer and equate when you want the vent to start opening and simply rotate the cylinder until the shutter begins to open.